The old model, which is still being forced along the aging and unbending tracks of tunnel vision determinism, teaches that ‘economic growth’ is the be-all and end-all of planetary prosperity. Never mind that it is quite literally ‘costing the Earth’ – and will require another five Earths if all seven billion citizens are to achieve the supposed goal of attaining a ‘standard of living’ equal to that of post-industrial countries like Northern Europe. Yet, according to its protagonists, an eternally expanding globalized economic market place remains the only valid prescription for this long suffering and deeply wounded planet. They still adulate notorious figure heads of the past, such as Adam Smith and John Maynard Keynes, neither of whose visions of a sustainable economic order have proved equal to the actual task at hand. 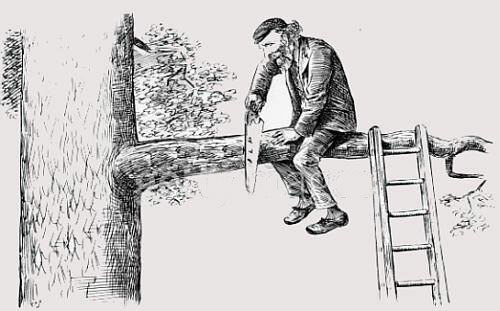 The best way to visualise the activity of a marketplace which deals in finite planetary resources as though they were infinite, is a man in a tree steadily sawing off the branch he is sitting on. And yes, he’s three quarters of the way through that branch at the time of going to press. But there is another paradigm pushing its way up through the morass of discarded steel and concrete which constitute the scrap heap earth economic order; and that is an altogether different baby, with its roots in pre-industrial revolution practices where the land and its resources were regarded with respect and awe, and held to be essential to the health and well-being of all who engaged with them. Those who hold that the status quo still provides the solution for an expanding global population, should do a bit of serious homework. They should consider the fact that 40% of the World’s best farmland has been rendered incapable of growing food, due to around 100 years of absolute exploitation of the soil by large scale, monocultural farming practices and the profligate application of millions of tons of toxic pesticides and synthetic fertilizers; all of which deplete the life force of that most valuable of all resources: the top twelve centimetres of soil which all cultivated edible plants depend upon for their nourishment. In the UK, some 60 tons of topsoil per hectare are lost from arable land every year to the ruthless ‘efficiency’ of high tech, soulless mining operations conducted by Big Pharma Agribusiness Plc. In the USA it is considerably worse. Bear in mind that it took millions of years for nature to build that topsoil. How could mankind have become so blindly profligate? In case readers should think I’m talking about some futuristic utopia, let it be known that models filling this description are already in operation all over the world. In the UK, alternative currencies operating under what are known as ‘LETS Schemes’, are gathering momentum. The Bristol Pound, which is supported by the mayor, operates in over 100 small community oriented businesses in the City. The Lewes and Totnes Pounds have been part of community life for more than 20 years, and such creative alternatives to mainstream trading are springing up in London, Liverpool and many other towns and cities throughout Europe. This entry was posted on 10 November, 2016 in homepage and tagged Adam Smith, agribusiness, corporate, environmentalism, farming, John Maynard Keynes, Julian Rose, planet earth, top soil. Bookmark the permalink.